← A New Type of Renaissance (Wo)Man: The Farmer! Why, why, WHY would I get up at 6:30 AM on a Saturday morning? I didn’t. I got up at 7:15, fifteen minutes late to pick up my best friend to go to the Half Moon Bay Art and Pumpkin Festival. I thought she was being ridiculous about being stuck in traffic, but as we crawled along Highway 92, I was glad we left when we did. Had we left any later the extra 15 minutes we spent in traffic would have easily turned into an extra hour. Many of the parking lots we came across were already full, and the event had just started! Farmer Mike has been creating masterpieces for 25 years. 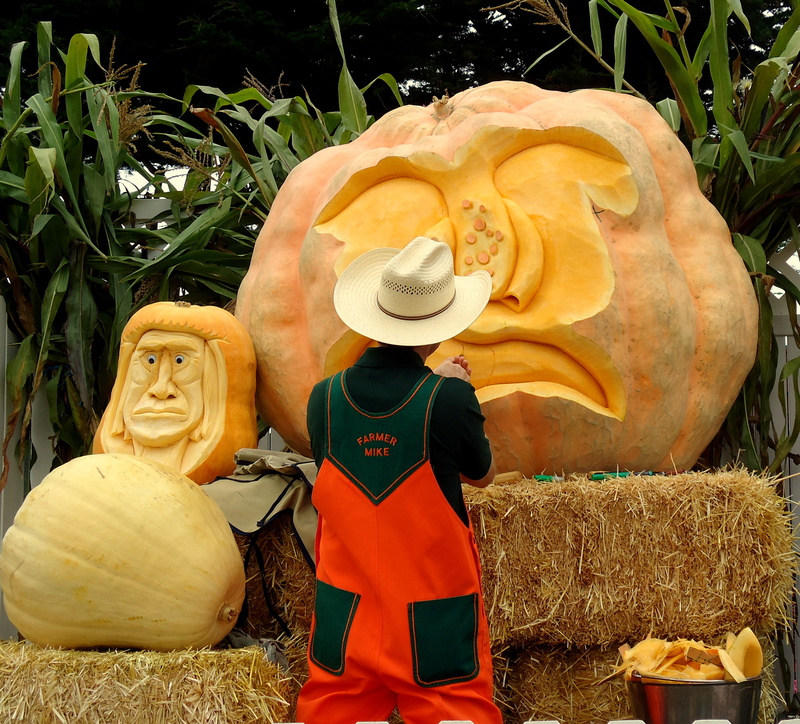 The Atlantic Giant Pumpkin, seen here is a variety known for yielding humongous results. Andy sharing the history of the farm. “Larry wanted a place where kids could run around and not have their moms worry.” Andy says. 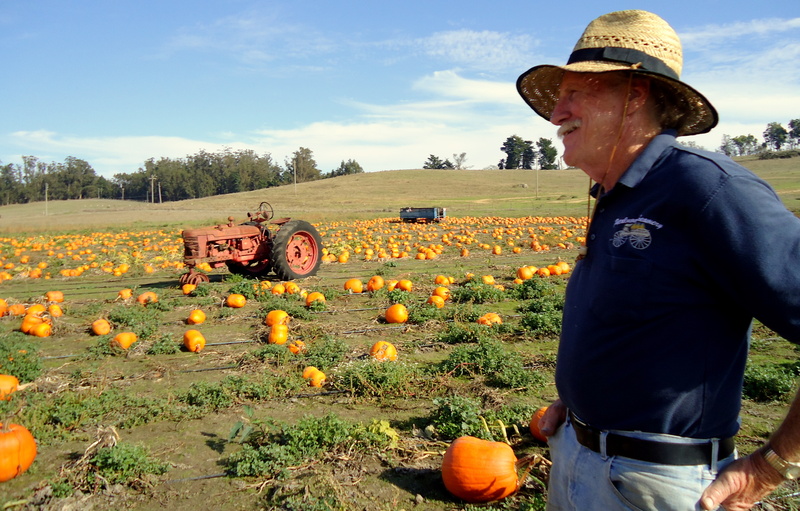 Andy Wells works the pumpkin patch each year, pointing out to visitors great tips on choosing your pumpkin, or where to dig for potatoes. Andy starts up his tractor and gives visitors tours of the 480 acre farm, pointing out the white Sears Roebuck Kit Home perched above the patch, the hay pyramids, and beyond them, their 350 Jersey cows. While the farm isn’t certified organic, it is certified humane, from cow to pumpkin. Peter and his team rotate the pumpkin and potato crops; while the produce is being grown on one field, the other is being planted with fava beans for their cows, replenishing nitrogen levels in the soil. The pumpkins and potatoes benefit greatly from the hands-on treatment, and bright, robust Jack-o’-lantern varieties meet you on your drive in. On the opposite side, visitors roll their provided wheelbarrows over to the potato field, unearthing red bliss, russet, butterball, and yukon gold potatoes. Up on the hill, housed by a large tent you’ll find more Jack-o’-lanterns, as well as over a dozen lesser-known pumpkin varieties and winter squash. Shades of orange, yellow, green, white, and even blue-green in an array of sizes and shapes jog your creativity. Grace Wells, who works for Spring Hill Dairy, leads visitors on a delicious cheese tour, sampling a smorgasbord of different flavors, from fresh unadulterated curds to their award-winning Sage Cheddar. She also provides tips on their pumpkins—the Jack-O’-Lantern may be your go-to for carving a spooky face, but for a smooth pumpkin puree, go for the Sugar Pie variety; albeit smaller, it yields a less-stringy, sweeter flesh! 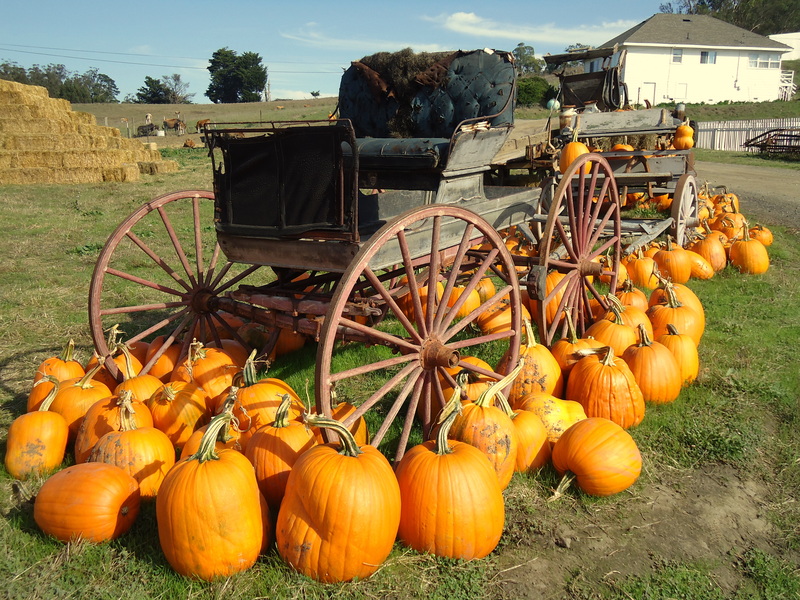 You may have been on a field trip to a pumpkin patch yourself as children, but if faced with the opportunity, drive out to a pumpkin farm! The experience is unmatched, the farmers armed with wealth of knowledge—from carving tips to recipes. Meet the land, animals, and people behind your future jack-o’-lantern! 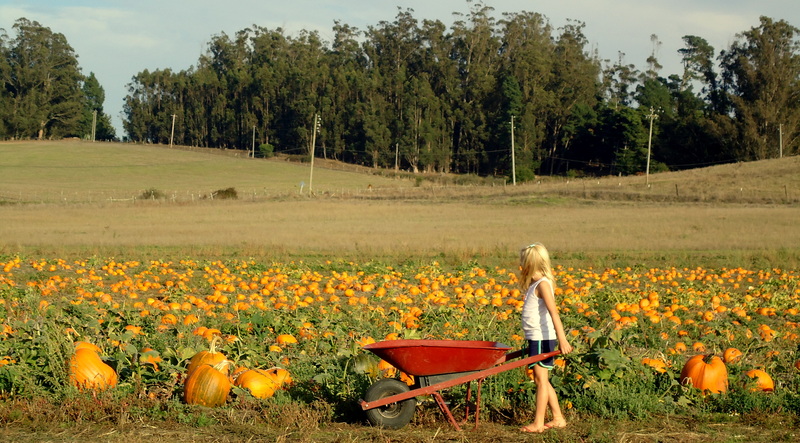 This entry was posted in Food Warrior Interns, On the Farm and tagged california, charlotte simpliciano, food warrior, half moon bay, petaluma, pumpkins, Real Time Farms. Bookmark the permalink.